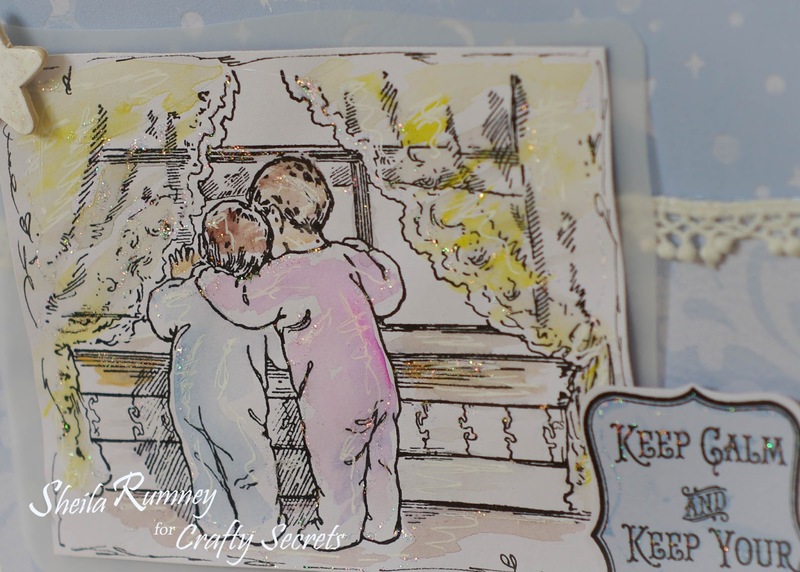 Welcome to the Crafty Secrets January Linky Party. This month, we used the new Bedtime Kids digital stamps to create our projects. Each design team member has prepared a creative tutorial to inspire. I created this cute and easy background paper using clipping masks in Photoshop. Determine the measurements of your project. Then open a new file and add the dimensions. Open all files to be used and drag and drop the background paper to be used using the Move Tool. Moving the Stars and Moon digital file to the top. Next add a New Layer and click on select the Paint Bucket Tool. Then select the color to be used and click in the middle of the artwork to apply the color. Next clip the color to the Stars and Moon layer by clicking Ctrl G on a PC or Cmd G on a Mac. Continue to add additional files or effects. Once complete, save file and print. For the cute image I heat set the ink by using my heat gun, then I added water colors to the image. Now, go visit the rest of the design team blogs below and be sure to leave them some love. 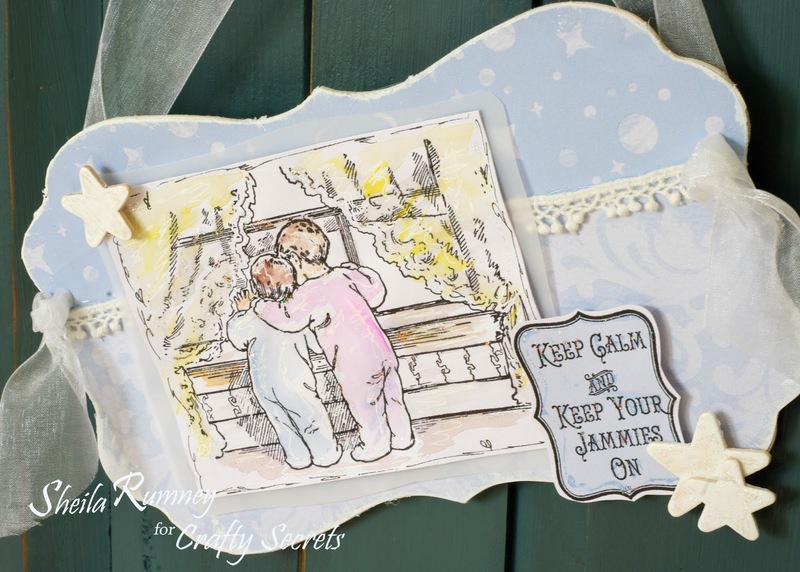 Then link up your own Crafty Secrets project on the Blog and you could win the enter Bedtime Kids Stamp Set! We've loaded a FREE image from the set into this month's Linky Party Post as our way of thanking you for playing along. You can download the image and use it your Linky Party project, or use one of the FREE PRINTABLES found on the blog page The rules are simple: Just create a NEW project featuring Crafty Secrets and link it up on the Crafty Secrets blog before midnight Pacific Time on Sunday, Jan 18th. Wishing you a creative day, dear friends. This is stunning! I love how you colored "wrinkles" into the jammies...and the tutorial was wonderful, too. I've just ordered Photoshop Elements, so hopefully I can finally follow along with your wonderful tutorials without "translating" everything into PaintShop Pro. Woot! Thanks for all the love and artistry you built into this gorgeous project! Fantastic Sheila! Your tips and tricks are always SO helpful! Love what you've created today and I have to say it again ... what you accomplish with this software just blows my mind!! Another informative well designed creation ... thanks so much! Oh.. to have your computer skills!! Great job on this Sheila! Totally adorable! I miss ya! So sweet Sheila. Did you use cardstock or watercolour paper, if the latter what weight? I have tried cardstock and find it pills but maybe it's because my cardstock is specially for copics. I love the soft pastel colours you have created. Thanks for a great tutorial. You are so creative in photo shop (I wish I had it)...but if I ever get it , I know where to look for help....such a pretty and soft project....I just love it!!! This is so so so pretty! Love the soft colors and your tutorial is wonderful!!! great tutorial! I'm not quite at your level of digital comfort yet, but I love seeing how you create! Seeing your card Sheila before I left was what inspired me to make some paper for our Bedtime Kids Set. I love this Wall hanging you created and THANK YOU so much for your inspiring and informative tutorials!!! I love this bedtime set, too. Do you use a laser printer or an inkjet for the B&W printout (that gets colored)?